The Bronx isn’t the best-known place for a fun date but it might just be the hidden gem you’ve been looking for. 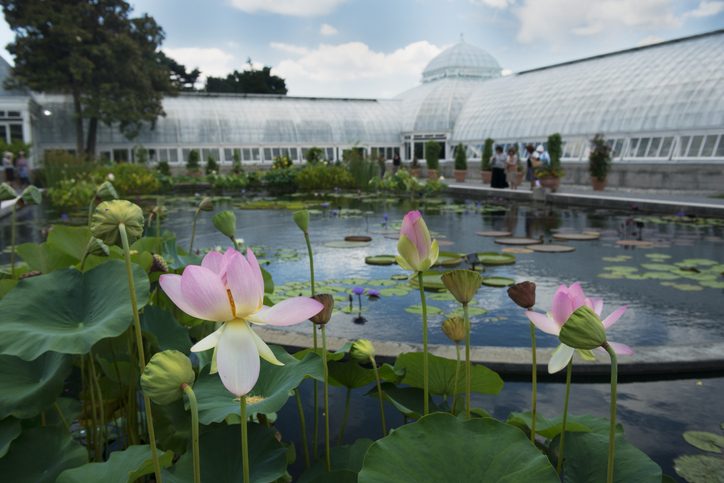 The New York Botanical Garden itself is just one of the big green spaces you can enjoy. Central Park might be the apple of your eye but Pelham Bay Park is actually the largest park in New York City. If you and your date have established that you want to get out into nature, make the trip out to the Bronx. Yes, it’s a bit of a distance but there is a charm here of its own you might be missing. The Billionaire’s Row is here, lined with live-in castles. There are quaint brick houses and Tudors too. The Grand Concourse, which is the Bronx “Park Avenue” was designed with the Champs Élysées in Paris in mind. The Bronx has a high density of art deco housing stock and an authentic Little Italy. The Bronx has gone through a spectacular transition phase so if you haven’t been there in a while, take the opportunity while it’s still a little bit of a secret. This estate sits on 28 acres in the Hudson Hill area of Riverdale. You and your date can go on a long walk and get to know each other. The gardens are on the slopes that overlook the river so the views are quite spectacular. The Café on the grounds offers incredible views of the river and the Palisades. All of the items on the menu feature local and seasonal ingredients from the Northeast. If you plan your trip right, you can go for Afternoon Tea in the Café here. It includes scones, tea sandwiches, and tiny desserts. You can (and should) upgrade to high tea to get the sparkling wine with strawberries and cream. This isn’t something you can do in every borough. If you’ve never gone horseback riding, you can take private lessons with your date. You can choose English or Western riding styles. The Bronx Equestrian Center is an equestrian center in Pelham Bay Park. If you and your date are looking for something new, adventurous and fun, this could be the perfect experience. You can go on a beautiful trail ride, which usually lasts about 45 minutes. This is the premiere concert hall in the borough and it hosts some of the greatest acts. It’s a not-for-profit center and the caliber of performance is incredible. Free to the public, you can take in many local and international artists here. There is ballet, jazz, classical music, and dance. If you’re spending a day in the Bronx with your date, this is a great place to visit. If you and your date have an affinity for the Bronx and local history, it might be of interest to check out Edgar Allen Poe’s cottage. This unique date venue could forge a solid connection between the two of you. It is hidden away and feels like miles away from busy city life. Here, he wrote poems, “Annabel Lee” and “The Bells.” The cottage was built in 1812 and the city of New York has owned it and taken care of it since 1913. The cottage itself was moved into Poe Park and is the last remaining building in the Bronx area that was once known as Fordham Village. This restaurant has a fantastic rooftop with a Manhattan vibe to it. It feels like a hip and sophisticated place to go for food and drink. If your date didn’t know about it before, they’ll be impressed you suggested it. If you’re going to the botanical gardens, this is a good place to come after. You may experience a bit of a wait time but it’s well worth it. Put your name on the wait list and take a little walk around Little Italy of the Bronx. There’s a great ambiance upstairs. Arthur Avenue is the hub of Little Italy and all of your senses will tap into the authentic vibe of Italy. Trattoria Zero Otta Nove is one of the best spots on the Avenue (also known as AA). The pizza is paper thin with a perfect amount of sauce. The Bronx offers a lot of outdoor experiences for you and a date. It’s a great place to walk around with your date, chatting and getting to know one another in the expansive parks. There are many venues for any of your tastes. Taking in some of the historical sites can create a great space for conversation. Don’t discount this area for a fun dating experience.